Black-eyed peas are often eaten on January 1st to bring prosperity into the New Year. This is a nice twist on traditional Southern dishes. In a small bowl, whisk together the seasoning ingredients. Heat a medium sized pot over the flame. When the bottom of the pot is warm, add the oil followed by the onion. Add a pinch of salt and stir so the onion is coated with oil. Let sauté for about a minute and then add the carrot, stir and allow the onion and carrot to cook together for about 5 minutes. 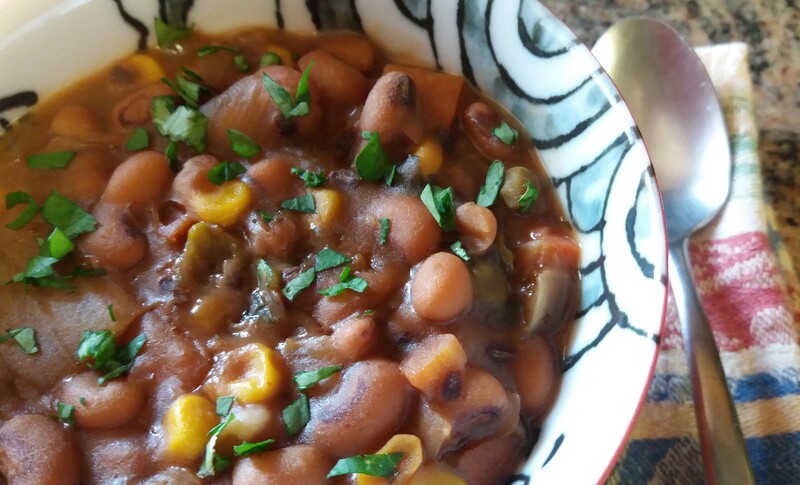 Add the black-eyed peas along with any leftover juice from cooking the beans (or juice from the can). Add the seasoning and enough water to submerge the beans. Cover and cook for together allowing the dish to harmonize for about 10 minutes. Add the corn and green peas and cook an additional 5 minutes. Serve garnished with parsley. Enjoy!